The increasing use of SMD filters over conventional panel mounted filters has simplified assembly methods, reduced production costs and enabled smaller volumetric efficiencies to be gained giving a greater choice of options to the designer - particularly shorter lead-times for development samples. KPD continues to refine existing ranges, explore new ones and bring on board new materials, like lead free dielectrics. For example, the SYFER E01 and E07 ranges of feed through MLCC ‘C’ filters now have extended working voltages from 25Vdc to 200Vdc, and in certain cases up to 500Vdc. This will significantly broaden the market for these devices. These surface mount EMI filter 3 terminal chip devices are designed to offer reduced inductance compared to conventional MLCC’s when used in signal line filtering. The filtered signal passes through the chip’s internal electrodes with the ‘noise’ filtered to the grounded side contacts, resulting in reduced length noise transmission paths. 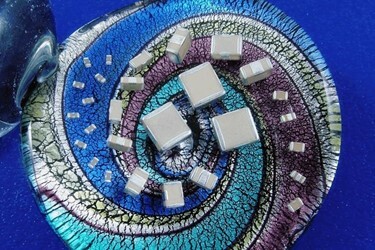 Available in C0G/NP0 & X7R dielectrics, in case sizes 0805 to 1812. Current ratings are 300mA to 3A with voltage ratings of 25Vdc to 200Vdc (500Vdc in some case sizes). Particularly effective in replacing conventional array filters in medical implantable devices is the SYFER E03 (X2Y) range. Available in case sizes from 0805 to 2220 these are integrated passive devices featuring both common and differential mode capacitors in a single MLCC chip. C0G and X7R dielectric versions are both available options. X7R dielectric versions are available with KPD's proven FlexiCap™ termination which is strongly recommended for new designs. Ideal for both signal and power lines, and ensuring impressive EMI filtering performance, is the SYFER SBSP range of surface mount pi-filters. With a size of only a 1206 chip they offer an unbeatable combination of size and performance. Ideal for telecoms, power supplies and industrial electronic equipment. The operating temperature range of -55°C to 125°C ensures they are also suitable for mil/aerospace applications. The use of X7R and C0G ceramic dielectrics sees capacitance values from 22pF to 150nF with a 1A current rating. They have working voltages up to 100Vdc. FlexiCap™ termination is used throughout the range and all versions are available with either tin or tin/lead finishes. Note: Dielectric Laboratories (DLI), Novacap, Syfer Technology and Voltronics came together to form a single organisation, Knowles Precision Devices – they have now been joined by Johanson Manufacturing and Compex. This entity has a combined history exceeding 200 years and is a division of Knowles Corporation of USA, an independent publicly traded company.